Hydrangea Paniculata Grandiflora is a much sought after deciduous shrub or panicled hydrangea which is a native of south and eastern areas of China, Korea Russia and Japan. Located and published in the early 19th century the original plants were discovered growing in mountainous slopes and in sparse forests down on the valleys. Preferring full sun although tolerating partial shade like most hydrangeas it will grow on most soils if moist and well drained. The oval serrated green leaves are between 7-15 cm long providing a backdrop for the magnificent large, sometimes between 15-45cm long, panicles of creamy white flowers which are produced between July and September. These blooms as they age will turn a beautiful pink which heightens their appeal either as a cut flower for arrangements or as a flower for drying and of course as an informal hedge so one can overlook the fact that the foliage in autumn is fairly unremarkable. Paniculata Grandiflora is a magnificent variety of hydrangea in that the shape of the flowers gives an unusual edge to the plant and with them being quite big and ‘blousy’ can make quite a statement in the lower borders and beds. As the growth rate is quite reasonable a good show of blooms can be attained within a relatively short period of time and with the plant reaching heights of up to 2 metres this will certainly make an impact in the garden. 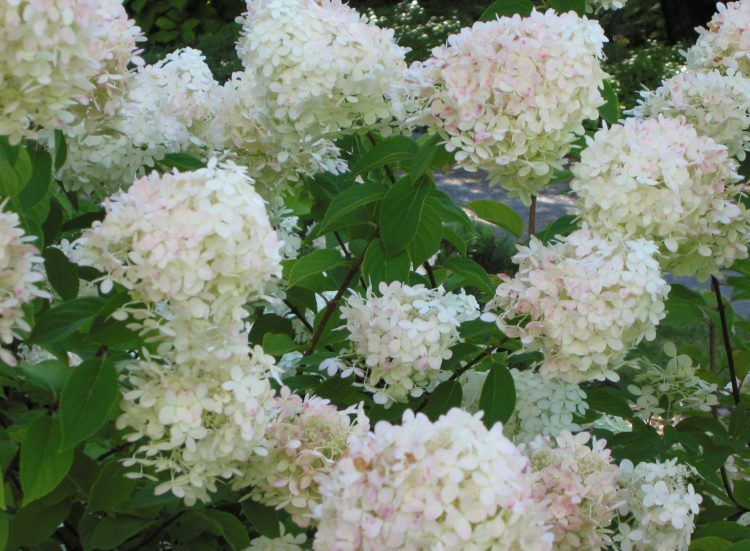 Pot grown plants which is how Hydrangea Paniculata Grandiflora would be supplied can be planted out throughout the year there are no restrictions as there are with bare root or root ball plants which can only be planted through the winter months. This means it is very convenient as there is no delay when setting out the garden design. You may possibly have some questions with regard to Hydrangea Paniculata Grandiflora in which case please do not hesitate to phone one of our team who will be only too pleased to help.